VpCI-423 is a rust remover that is harmless to people while effectively removing rust and tarnish from steel, iron, copper, brass, chrome, and aluminum. 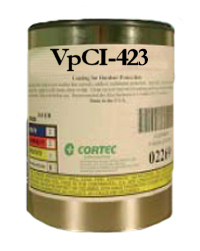 VpCI-423 removes corrosion from metal without creating waste disposal difficulties. When used as recommended, VpCI-423 will not harm human skin or adversely affect most paints, plastics, wood, textiles, ceramics, or rubber. Remov-ing corrosion from metal is easy. Apply VpCI-423 and rinse with water then use Cortec® VpCI-414 or VpCI-419 for added protection. VpCI-423 is completely organic and 100% bio-degradable, and does not have special disposal requirements for typical use. Waste treatment may be required if a sufficient quantity of pollutants (oil, solvents, dirt, grease) are introduced into the chemi-cal solution. Unlike conventional rust removers which can be ex-tremely dangerous to use, handle, and store; VpCI- 423 is so mild that minimal protective covering is needed. In addition, the non-toxic, non-flammable formulation has no pungent acid fumes. Being nearly odorless and extremely mild makes VpCI-423 easy to use. VpCI-423 is formulated to stay in place for special applications that require the chemical to cling to ver-tical surfaces or the underside of horizontal surfaces. VpCI-423 makes it easy to remove rust from tanks, vessels, outdoor machinery and equipment, walls, fences, railings, and vehicles. VpCI-423 can be applied using spray equipment, including air and airless spray, as well as by brush dip. For spray, brush, or roll-on applications; remove loose rust. Then apply VpCI-423 concentrate to the surface, let product stand for 10-15 minutes and rinse with Cortec® VpCI-410 series (typically, little or no rubbing is required). Reapply if necessary. Medium and heavy rust will take somewhat longer. For dip application; remove heavy deposits, loose rust, or tarnish. Soak part(s) in tank as long as required to remove corrosion. Remove from tank and rinse with Cortec® VpCI-410 series (VpCI-414/416) for added protection. Increasing temperature up to 110ºF (43ºC) will speed the cleaning process. VpCI-423 is available in 5 gallon (19 liter) pails. Store in a heated warehouse to avoid freezing.